Morgan City Rentals can provide beam clamps to aid in rigging applications. 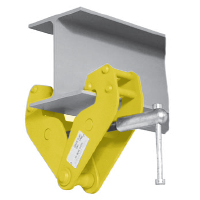 Made from steel, adjustable beam clamps attach to an I-beam for hoisting without drilling or welding onto the I-beam. Beam clamp rentals come complete with domestic shackles. 1. Do not exceed rated capacity. 2. Never pick up a plate whose thickness is greater than or less than the range of jaw opening steciled on the clamp. 3. Do not lift more than one plate or sheet at a time. 4. Position clamps so that loads are level. 5. Plate must be fully engaged to back of clamp throat. 6. Lifts and movements shall be mad slowly, do not bouce load. 7. Never drag a plate, especially out from underneath another. 8. On locking clamps, ensure lever is moved to locked position before making lift. 9. Only vertical/horizontal clamps allow lifting to and/or from a horizontal position. Vertical clamps are for vertical lifts only. 10. Polished and finished plates may only be lifted in accordance with manufacturer's recommendations. Check hardness of steel allowed. 11. Do not lift plates with coatings or mill scale that prevent gripping. 12. All clamps shall be identified to include manufactrurer, safe working load (SWL) and plate thickness range. 13. Store in proper location where it is not subject to abuse. 14. Personnel shall stand clear of load.